So many times I have finished a book long after I thought it should have ended. You know what I mean, right? You get about 4/5s through a book and are longing for it to be over. 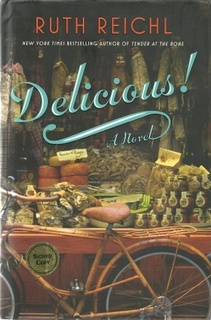 That was NOT the case with Ruth Reichl’s first novel – DELICIOUS! I did not want it to end. I was so into the characters and the duel story line that I am now ready for a sequel although I know there won’t be one. This was the story of Wilhelmina “Billie” Breslin and her journey. Not in the physical sense but in the personal sense. Billie has an awesome gift of a fine palate and the ability to devise a dish just from the tastes and smells. But she doesn’t cook. Not any more. One of the big questions throughout the book is WHY? …and her hunt for the illusive Lulu,whose wartime letters to James Beard are found in the library in a hidden room, keep her life on a constant merry-go-round.. So when Mother says it is wrong for us to eat better than our brave men overseas, I tell her that I don’t see how eating disgusting stuff helps them in the lest. But Mr. Beard, it is very hard to cook good food when you’re only a beginner!…I’m going to try again; I have my eye on the Peanut Butter and Lima Bean Loaf from a cookbook Mrs. Davis gave me,…. She definitely needed help and he gave her much for several years. Through the letters, the friendships, and her family she finally learns the truth about events in her life her entire perspective about herself, her family, and her friends change. The story is about people but it is also about food. Food that keeps people entertained, keeps people wanting more, keeps people alive, keeps people with family and friends. There are no recipes in the book just snatches of conversations about food, people intimately connected with food, and incidents involving the food industry. It is not an expose. It is a story. A life. A meal. All affected her life. And helped her come to terms with her fears – including cooking. Through out the book different dishes are mentioned: souffle, gingerbread, pumpkin ravioli, Yorkshire pudding, panettone. So many dishes I could make to ‘celebrate’ the book. I did so want to make her gingerbread but just ran out of time. It will be made. This is the JULY selection for The Kitchen Reader an online food related book club with members around the world.